The way we view the world around us is clouded by our culture, education and ultimately our worldview. We filter what we see, hear and read through what we have been taught or have seen and heard in the media, and if we are bold enough to admit it, we don’t always see things the way they really are. In Jerusalem on the Sunday before the traditional Passover feast, the people of Jerusalem witnessed a world changing event, something that set in motion the greatest weekend in all of history. However, as we will see because of their worldview, and their cultural expectations, they were not able to grasp what was happening. On that first Palm Sunday, Jesus rode into Jerusalem on a colt. The crowd was celebrating the long-awaited Messiah coming into the city, however Jesus was painting a visual picture, a parable for those who would look back on that day. The account begins with Jesus instructing two disciples to go and borrow a donkey and her colt. Jesus gave the disciples the instruction in verse 3, that, “If anyone says anything to you, say that the Lord needs them, and he will send them right away.” Jesus called himself the Lord, he was saying that he was in control, and the sovereign orchestrator of the events. Not only was Jesus the Lord over the events taking place, and the events that were about to take place, he was also the Lord over all creation. Jesus rides on a wild colt, Matthew is the only Gospel author who notes this detail, but Jesus was riding on an animal that was never ridden before, amid a screaming crowd. Jesus was showing, just like he did when he calmed the storm, the creator is in complete control over his creation. As Jesus rode down the hill to Jerusalem, the people threw down their cloaks on the road, symbolizing submission to Jesus as king (see 2 Kings 9). The crowd broke branches and palm branches and waved them as Jesus went by. This was significant because this reflected a scene that took place in Jerusalem about 200 years before, during the Maccabean uprising against the ruling Seleucid empire and the Hellenistic Jews. This is a fascinating time in the history or Israel, but the palm branches became symbols of the revolt and the interesting feature of the Maccabean revolt is that after entering Jerusalem, the rebels, came into the temple and cleansed the temple of all the false idol worship. This is also what Jesus did as he went to the temple and cleared out the traders. The people must have seen the messianic symbolism and they began to ask the question which we find in verse 10, “who is this?” (see Matthew 21:9). The crowd around Jesus had no doubt that he was the promised Messiah, the one who would set up his throne in Jerusalem, ushering in a new Kingdom and empire for Israel. But they were filtering what they were seeing through their worldview, they were seeing what they wanted to see. Jesus was coming to introduce the Kingdom, but not a temporary earthly kingdom, but to overthrow the works of the devil and setup the eternal Kingdom of God on the earth. Jesus was walking out a parable, and like most of Jesus’ parables, the people did not understand what he was saying (read Matthew 13:10-17). The crowds on that first Palm Sunday wanted a Warrior King, they wanted the prophesied messiah to come and re-established the glory days of the nation of Israel. But we know that Jesus came as the suffering servant of Isaiah 53. The crowd was seeing without really seeing, they were hearing but not understanding (Matthew 13:13). Jesus knew that he was about to disappoint these crowds, he knew that they would be turning on him in a few days and calling for his crucifixion. But all the while as Jesus was riding on the colt into Jerusalem, he was thinking about you and me, he was thinking about the mission he was on. Jesus saw through the lens of heaven, he saw the purposes of God through all eternity. But what about us? We know that Jesus came 2000 years ago as the suffering servant, entering Jerusalem knowing that he would suffer and die, and that God would raise him from the dead, to be the atonement for our sins, but what about Jesus today? Are we looking for a messiah to call on when we have a problem or need something to be made right? Are we only looking for a messiah who would make all our injustices right? Or are we really looking forward to the King Jesus coming to rule over the earth in justice and righteousness. Are we looking for a temporal messiah rather than the eternal Lord? Jesus spoke about the end times in Matthew 24, where Jesus goes on to describe the great tribulation, famines earthquakes, terrible unprecedented global disasters and persecution. Sadly, the church is being deceived and losing its focus on the eternal Kingdom of God, rather the church is focusing on the temporal things such as wealth and prosperity. Are you seeing but not seeing? Hearing but not understanding? Are you so caught up in the things of this present age, that you don’t even have a desire for Jesus to come again? As Jesus was teaching in John 8 he said to those who believed in him, “…If you abide in my word, you are truly my disciples, 32 and you will know the truth, and the truth will set you free.” John 8:31-32. Let us be a people who have a Biblical Worldview and an eternal perspective. Sight is one of our most valuable senses, but there is a blindness that is worse than physical blindness, it is spiritual blindness. Physical blindness even though it could span one’s entire lifetime, is not as bad as spiritual blindness that can lead to an eternity separated from God. This week we remember Palm Sunday, the day Jesus rode into Jerusalem on a donkey with crowds cheering him on. Before this day, Jesus had been preparing his disciples for His crucifixion In the Gospel of Luke, he tells them three times what is going to happen in Jerusalem, but they do not understand what he is talking about. To them, Jesus was the invincible Messiah and he was heading to Jerusalem to establish his earthly throne. They did not see the full picture and the amazing purpose of God for Jesus coming to the earth. Jesus takes his disciples aside and begins by saying that everything that is written through the prophets about him will be accomplished. The disciples knew the scriptures and would have been taught that the Messiah would come and re-establish Israel as a mighty nation. But they did not dwell on passages like Isaiah 53, the prophecy about the suffering servant, rejected by man and even punished by God. That prophecy didn’t fit their understanding or their paradigm of what God was about to do. As Jesus begins to elaborate, the Gospel of Matthew makes it clear that Jesus predicted his death would be by crucifixion; the type of death that was for the worst criminals, the type of death that, according to the Law of Moses, meant the person was under a curse by God. No other person in all of history was less deserving of suffering than Jesus. Not only did Jesus suffer an excruciating death, he also took on the full punishment of the wrath of God for our sins. That was the real suffering of the cross. It was a suffering by design; it was the plan of God all along (see Isaiah 53:10). In verse 34 we read; “The disciples did not understand any of this. Its meaning was hidden from them, and they did not know what he was talking about”. Luke emphasizes the lack of understanding by repeating it three times. The disciples were blind, they did not see with spiritual eyes, they were looking for the establishment of an earthly kingdom but the truth was hidden from them. In order to reinforce their lack of understanding, the very next miracle we have recorded is that of Jesus healing a blind man. It is clear that when Luke penned this Gospel, he knew what he was doing when he wrote about the healing of the blind man. Jesus performed many miracles that were not recorded for us in the Bible, but this one was significant and it’s positioning in the Gospel is key. Notice the desperation in this blind man, he was rebuked and told to be quiet by the crowd, but he kept on yelling with all his might. The reason he was so desperate was that he understood his blindness, and he had faith that Jesus could do something about it. Notice the contrast; here was a blind man who was desperate to be able to see, and on the other hand, you have the disciples, those closest to Jesus, who were spiritually blind to what was about to take place. The most significant event in human history was lost on those participating in it, because they were expecting something else. 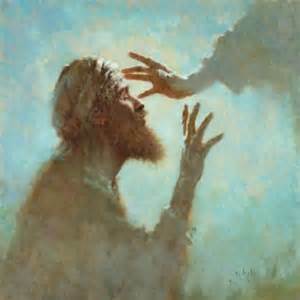 The blind man knew who Jesus was, he recognized that Jesus was the Messiah; he praised God and followed Jesus. Those who are the most blind, respond the most readily to the Gospel. Those who realize the depths of their sin are the most appreciative of their salvation. Remember the words of Jesus to the Laodicean church in Revelation 3:17, “For you say, ‘I’m rich; I have become wealthy and need nothing,’ and you don’t realize that you are wretched, pitiful, poor, blind, and naked.” This letter to the Laodicean church was not to those who did not believe in Jesus, this was the early church, they were blind, because they did not completely grasp the truth of the Gospel. Jesus was with God at the beginning of creation, he spoke the earth into existence. Jesus also knew that when he created that hill called Calvary, he would ultimately suffer and die on that hill. Jesus also formed the tree that was cut down to make the cross. He created the instruments of his own suffering, because of his love for you. Jesus not only prepared the instruments of his suffering, he also willingly walked into Jerusalem on this day two thousand years ago. It was because of his love for you that he made this journey to Jerusalem and willingly subjected himself to the excruciating death on the cross. As we go into this week, a week where all around us we see the cross – that should remind us of the foundation of our faith. Without the cross, we have no Savior, and without the resurrection we have no hope. The truth about Jesus was hidden from those around him when he walked the earth. And in the same way the truth of the word of God is not self-evident. The truths of the Word of God are revealed to us by the Holy Spirit. When God starts speaking to you through His Word, it comes alive and in fact you wake up in the morning, looking for the Bible. As you read about the crucifixion account in the Gospels this week, spend time praying and asking the Holy Spirit to give you insight and understanding. But make it personal, realizing that Jesus was thinking about you as he walked the road to Jerusalem.